Simply put Eva is a great, awsome, and then some. I have only seen 5 ep of Rahxephon, so most won't care now, but the series seems a little too much like eva. So eva wins hands down. don't hate me i'm just posten so I can use a costom avatar. Radio_Free_Mars wrote: don't hate me i'm just posten so I can use a costom avatar. just a tip, you can post just to get an avatar, just don't say that your doing so. Ok, about a year ago or so I bought some Rah episodes on VCD. At the time my computer couldn't play them and my DVD was definitely not compatable. Recently I've upgraded computers and now have the chance to play the VCDs. So yesterday I checked out episode one. It made me want to watch Eva and I can't watch another episode of Rahxephon now. Today I gave it a second chance, but still, it draws me to want Eva. Note: I bought the VCDs before it was liscensed. I do not support bootleggers. I guess because of how similar it is to Eva. I only saw the first 4 eps so I can't really say but from that 4 from what I saw, it made think "hey I've seen this before....."
GandalfsStudent wrote: angels aren't aliens. Umm all of them did not come from space... I mean the one they found in like lava pit thing wasnt from space. do we know where the Angel's actually came from? 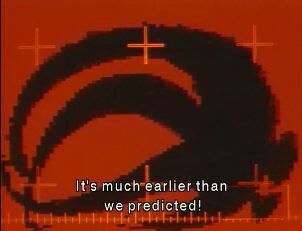 I wonder whether all the Angels were in a dormant, embryonic state like the one in Magma Diver (Sanda-sumpin-or-other?) and were somehow stirred up by 2I; I think people would have noticed if critters that big were running loose all along. Also, I find it very interesting that the Magma one is found as a humanoid embryo (rather like the Adam embryo), but once it awakes it quickly morphs into a weird, invertebrate form; I would guess that the wild, almost unlimited potentiality of form that the Angels possess is somehow related to their partaking of the Fruit of Life. The fruit of like is basically their S2 which gives them unlimited energy. When you say humanoid, what you mean? The Adam what we saw was from 2I, he was just sleeping, and wasn't just "born" or whatever the word is. saiyajin prince wrote: The fruit of like is basically their S2 which gives them unlimited energy. When you say humanoid, what you mean? The Adam what we saw was from 2I, he was just sleeping, and wasn't just "born" or whatever the word is. By humanoid I mean it looks more or less human, with two arms, two legs etc. or at least more fully developed. 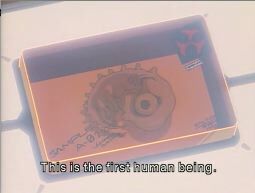 According to the Evangelion faqs at www.evabeast.com, the Angels (aside from Lillith) were "born" from Adam in a similar sense to the Lillims (humans) being "born" from Lillith. I don't know if the show ever clues us in on this, but it does seem to make sense, at least to me. I think Evangelion is much better, but that is just my opinion. 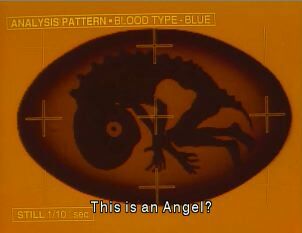 Joe24 wrote: According to the Evangelion faqs at www.evabeast.com, the Angels (aside from Lillith) were "born" from Adam in a similar sense to the Lillims (humans) being "born" from Lillith. I don't know if the show ever clues us in on this, but it does seem to make sense, at least to me. but in eva mythogolgy how were human's born from Lilith. MDWigs wrote: Then name me another anime series that has done something similar. Name me a series that contains the breadth of ideas that Eva has (old ideas they may be) and combines them all into a unified story.